XIAOMI REDMI Note 3 5.5 inch 4G Phablet Android 5.0 Helio X10 64bit Octa Core 2.0GHz 2GB RAM 16GB ROM Finferprint ID 13.0MP + 5.0MP Cameras GPS - Gray. Redmi Note 3 retains Helio X10, adds full metal body, fingerprint sensor and massive 4000mAh battery! 13MP/5MP cameras on Redmi Note 3 take gorgeous pictures. Here are some unedited photos. Redmi Note 3's fingerprint sensor unlocks in just 0.3s. Body has a smooth sandblasted metal finish too. Redmi Note 3 has a massive 4000mAh battery but is only 8.65mm thick, weighs 164g - just 4g heavier than Redmi Note 2! Buy this Cellphone and Save 21% OFF + Free Shipping for XIAOMI REDMI Note 3 5.5 inch 4G Phablet. 10.6 inch Chuwi Vi10 Android 4.4 + Windows 8.1 Tablet PC 1366 x 768 IPS Screen Intel Z3736F Quad Core 1.83GHz 2GB RAM 32GB ROM WiFi Bluetooth OTG - Black. Delicate design, portable and comfortable to touch. So buy this Tablet PC and Save 50% OFF + Free Shipping for 10.6 inch Chuwi Vi10 Android 4.4 + Windows 8.1 Tablet. Bluboo X9 Android 5.1 4G Smartphone 5.0 inch FHD IPS Screen MTK6753 64bit Octa Core 1.3GHz Fingerprint Sensor 3GB + 16GB 13.0MP + 5.0MP Cameras OTA - Silver. Buy this Cellphone and Save 14% Off + Free Shipping for Bluboo X9 Android 5.1 4G Smartphone. Aiwatch Q8 1.44 inch Anti-lost Smartwatch Phone IP53 HD Touch Screen Remote Capture Pedometer Music Sleep Monitor - White. Unlike most smart watches, the smartwatch can independently make / receive phone calls with its own SIM card. Save time: Access notifications quickly on your wrist using smartphone sync. With built in apps and on-board storage, enjoy your music on the go. The 1.44 inch HD display delivers stunning clarity and color. Wear the watch at night to track and improve your sleep pattern. As a fitness companion, the smartwatch tracks your health measuring every step you take to help you achieve your health goals. Sometimes you just need a gentle reminder to stay active: built-in motion tracking helps you to minimize sedentary times. Sound recorder, alarm clock, calendar, calculator, FM. Buy this Watch and Get 10% OFF + Free Shipping for Aiwatch Q8 1.44 inch Anti-lost Smartwatch Phone. Elephone Ivory Android 6.0 4G Smartphone 5.0 inch Screen MTK6753 64bit Octa Core 1.3GHz 2GB RAM 16GB ROM 2.5D 13MP + 2MP Dual Cameras GPS WiFi - Gray. Buy this Cellphone and Save 17% OFF + Free Shipping for Elephone Ivory Android 6.0 4G Smartphone. Mstar S700 Android 5.0 4G Phablet 5.5 inch HD IPS Screen MTK6753 64bit Octa Core 1.3GHz 2GB + 16GB 13.0MP Camera OTG - White. Light sensor, G-sensor, P-sensor, Gesture, Fingerprint sensor. Buy this Cellphone and Save 23% OFF for Mstar S700 Android 5.0 4G Phablet. Ulefone Paris X Android 5.1 4G Smartphone 5.0 inch 2.5D HD Screen MTK6735 64bit Quad Core 1.3GHz 2GB RAM 16GB ROM 13.0MP + 8.0MP Cameras OTG Corning Gorilla Screen - Black. Buy this Smartphone and Save 24% OFF + Free Shipping for Ulefone Paris X Android 5.1 4G Smartphone. Leagoo Alfa 1 Android 5.1 3G Phablet 5.5 inch Screen MTK6580 Quad Core 1.3GHz 2GB RAM 16GB ROM 13.0MP + 5.0MP Cameras GPS OTG WiFi Bluetooth Hotknot - Black. Buy this Cellphone and Save 19% OFF + Free Shipping for Leagoo Alfa 1 Android 5.1 3G Phablet. Landvo XM100 Android 5.1 3G Smartphone 5.0 inch Screen MTK6580 Quad Core 1.2GHz 1GB RAM 8GB ROM Dual Cameras GPS OTG FM - Black. Buy this Cellphone and Get 19% OFF + Free Shipping for Landvo XM100 Android 5.1 3G Smartphone. Save 8% OFF For 400+ Fashionable Headphones. Want to enjoy deep bass of music or game? Save 8% OFF For 400+ Fashionable Headphones. With coupon "headset8" at checkout. Shop Now. Save 77% OFF For Ulefone Be touch 3 Smartphone. Ulefone Be Touch 3 5.5 inch 4G Phablet Android 5.1 MT6753 64bit Octa Core 1.3GHz 3GB RAM 16GB ROM 13.0MP Main Camera HiFi 2.5D Screen - White. By long pressing the fingerprint area, you could unlock the screen, designed to protect your own information and privacy. So buy this Smartphone and Save 77% OFF + Free Shipping for Ulefone Be touch 3 Smartphone. Save 50% OFF For U BOX i One (i828) TV Box. U BOX i one (i828) TV Box Amlogic S802 Android 4.4.2 Quad-Core WiFi MIMO Bluetooth 4K x 2K H.265 Google TV Player - Black. The U BOX i one (i828) brings high performance 4K x 2K UHD streaming from the internet and local media to your TV. The powerful Quad Core Amlogic S802 processor with the Octa Core Mali-450 excellent graphics engine provides stellar performance for high definition video playback. XBMC runs smoothly with 4K hardware decoding from local media and your favorite XBMC streaming add-ons. Features 2GB DDR3 RAM 8GB eMMC storage ROM(with support for micro SD card up to 32GB). BUy this product and Save 50% OFF For U BOX i One (i828) TV Box Amlogic S802 Android 4.4.2 Quad-Core 4K*2K TV Player. OUKITEL K10000 Android 5.1 4G LTE Phablet 5.5 inch HD IPS Screen MTK6735 64bit Quad Core 1.0GHz 10000mAh Large Capacity Battery 2GB RAM 16GB ROM Bluetooth 4.0 13MP Camera - Black. Buy this Cellphone and Save 12% OFF + Free Shipping For 5.5 inch Oukitel K10000 Android 5.1 4G Smartphone 10000mAh Battery. Elephone M2 5.5 inch 4G Phablet Android 5.1 MTK6753 64bit Octa Core 1.3GHz 3GB RAM 32GB ROM 13.0MP + 5.0MP Fingerprint Recognition Bluetooth 4.0 - Black. So buy this Cellphone and Save 55% OFF For Elephone M2 5.5 inch 4G Smartphone. 25% OFF For Cubot X17 5.0 inch 4G Smartphone. Cubot X17 5.0 inch 4G Smartphone Android 5.1 MTK6735 64bit Quad Core 1.3GHz Hotknot 3GB RAM 16GB ROM 8.0MP + 16.0MP Cameras Bluetooth 4.0 - White. So buy this Cellphone and Save 25% OFF + Free Shipping for Cubot X17 5.0 inch 4G Smartphone. ASUS ZenFone 2 (Deluxe ZE551ML) 4GB RAM 32GB ROM Android 5.0 4G LTE 5.5 inch Phablet FHD Screen Intel 64bit Z3580 Quad Core 2.3GHz 13MP + 5MP Dual Camera - Blue. SIM: Dual SIM dual standby-by dual active. Buy this Cellphone and Save 16% OFF + Free Shipping for ASUS ZenFone 2 4GB + 32GB ROM Android 5.0 Smartphone. Elephone P8000 Android 5.1 4G LTE Phablet 5.5 inch FHD Screen MTK6753 64bit Octa Core 3GB RAM 16GB ROM Fingerprint ID 13.0MP Camera GPS 4165mAh Battery - Gray. SIM Card: Dual SIM dual standby, dual micro SIM. So buy this Cellphone and Save 52% OFF + Free Shipping for Elephone P8000 Android 5.1 Octa Core Fingerprint Smartphone. BLUBOO XTOUCH Android 5.1 Lollipop 4G Smartphone 5.0 inch FHD Screen MTK6753 64bit 1.3GHz Octa Core Fingerprint Recognition 3GB + 32GB 13.0MP Camera OTG - Black. Camera: Front 8.0MP + Rear 13.0MP cameras. Sensor? Light sensor, G-sensor, P-sensor. Fingerprint Recognition: Keep your privacy. Built in advanced fingerprint Recognition technology, functions can be locked individually. Safe as ever, feels even better. Bluetooth: BT4.0. GPS: GPS/A-GPS/Glonass. SIM Card: Dual SIM dual standby, dual Micro SIM cards. Get Special Offer: Save 55% OFF and Free Shipping For BLUBOO XTOUCH Android 5.1 Octa Core 32GB ROM. 5.5 inch OUKITEL K6000 4G Phablet Android 5.1 MTK6735 64bit Quad Core 1.0GHz 2RB RAM 16GB ROM 13.0MP + 5.0MP OTG 2.5D Screen Fast Charging - Gray. So buy this Cellphone and Save 17% OFF + Free Shipping For 5.5 inch OUKITEL K6000 Smartphone Android 5.1. Ecoo E04 3GB Lite 5.5 inch 4G Phablet Android 5.1 MTK6753 64bit Octa Core 1.3GHz 3GB RAM 16GB ROM 8.0MP + 16.0MP Cameras - Blue. Buy this Smartphone and Save $31 OFF + Free Shipping for Ecoo E04 5.5 inch Smartphone Android 5.1 Octa Core. 30% OFF For Letv 1s 5.5 inch 4G Smartphone. Letv 1s 5.5 inch 4G Phablet Android 5.1 MTK6795 64bit Octa Core 2.2GHz 3GB RAM 32GB ROM 5.0MP + 13.0MP Cameras - Golden. Sensor: Gravity Sensor, Proximity Sensor, Ambient Light Sensor and Fingerprint Sensor. Bluetooth: 4.0. Features: GPS, A-GPS, Glonass, Beidou. SIM Card: Dual SIM dual standby, one Nano SIM Card, one Micro SIM Card. So buy this Cellphone and Save 30% OFF For Letv 1s 5.5 inch 4G Smartphone Android 5.1 MTK6795 64bit Octa Core. 61% OFF For Meizu Metal Smartphone. 5.5 inch Meizu Metal Android 5.1 Lollipop 4G Phablet with Fingerprint Recognition Helio X10 64bit 2.0GHz Octa Core Bluetooth 4.1. Main Features: Display: 1920 x 1080 pixels 2.5D Screen, Corning Gorilla Glass 3. CPU: Helio X10 2.0GHz Octa Core. GPU: Power VR G6200. System: Android 5.1 Lollipop (Flyme 5). RAM + ROM: 2GBRAM + 32GB ROM. Camera: Front 5.0MP + Rear 13.0MP cameras. Sensor: Hall Sensor, Gravity Sensor, Ambient Light Sensor, Proximity Sensor, Gesture Sensor, E-compass. Bluetooth: BT4.1. GPS: A-GPS, GPS, Glonass, BDS. Buy this Cellphone and Save 61% OFF For Meizu Metal Smartphone Android 5.1 Octa Core Fingerprint. ONEPLUS X Android 5.1 5.0 inch 4G Smartphone with Qualcomm Snapdragon 801 Quad Core 2.3GHz Corning Gorilla Glass 3 Screen 3GB RAM 16GB ROM - White. Camera: 8.0MP front camera + 13.0M Pixels high definition back camera with flashlight and auto focus. Bluetooth: 4.0. GPS: GPS, A-GPS, GLONASS. SIM Card: Dual SIM dual standby, SIM1 is Nano SIM, SIM2 can be used in combination with a Nano-SIM card or a TF card of up to 128GB. Buy this Cellphone and Save 54% OFF For Oneplus X Android 5.1 5.0 inch 4G Smartphone 3GB RAM. 52% OFF For Onda V919 9.7 inch Windows 10 Tablet. Get 20% OFF For THL T6C 3G Smartphone. 5.0 inch THL T6C 3G Smartphone Android 5.1 MTK6580 Quad Core 1.3GHz GPS 1GB RAM 8GB ROM 8.0MP Main Camera WiFi - Black. Sensor: Gravity sensor, Proximity sensor, Light sensor. Bluetooth: 4.0. SIM Card: Dual SIM dual standby, one is standard SIM card, and the other is Micro SIM card. Buy this Smartphone and Get 20% OFF For THL T6C 3G Smartphone. Crazy Fall Promotion: $122.99 for Ulefone Paris Phones, $60.99 for BEELINK I68 TV BOX and $14.49 for Kingston 32GB USB + Free Shipping. Shop Now. 9.7 inch Teclast X98 Air III Android 5.0 Tablet PC Intel Z3735F Quad Core 1.83GHz QXGA IPS Retina Screen 2GB RAM 32GB ROM Bluetooth 4.0 HDMI 8000mAh Battery Capacity - Gray. Main Features: CPU: Intel Z3735F Quad Core 1.83GHz has a better performance, sixty percent power consumption reduction and almost half package areas than the 64-bit processor, delivering plenty of power for multitasking and fueling casual games and movies. GPU: Intel HD Graphic?Gen7? processor is better and faster in playing games and watching videos than the previous generation. RAM + ROM: 2GB + 32GB offers ultra-fast surfing online, video playing and 3D gaming experience enhanced with DDR3 memory which makes all applications faster. Whether it is needed for work, study or play, it will suit your all needs. Gravity sensing system: Can fluently and sensitively run various applications. 9.7 inch screen: 2048 x 1536 QXGA IPS Retina screen offers good experience for watching videos and browsing the Web. Android 5.0 system: Latest system with more excellent interface, compatibility and running effect. 8000mAh battery: Can meet the current, power and the temperature and increase the performance dynamically. Bluetooth 4.0: Supports fast transmission of data, pictures and files. HDMI output: You could use a HDMI cable to connect your tablet to output the tablet display onto TV screens, monitors or projectors, creating your personal home theater. Dual cameras: 5.0MP back camera with auto focus makes HD video recording and video calls more clearly and vividly. And you will be surprised at 2.0MP front camera for selfie. Other functions: WiFi/MP3/MP4/Calendar/Calculator supported. Buy this 9.7 inch Teclast X98 Air III Android 5.0 Tablet PC For Just $116.99. GoldHorse Bluetooth Speaker is one of the items that hikers or campers should never forget to take along with them for the wonderful purpose it serves in hiking and camping. You can use this multi-purpose speaker for hands-free calls, as a lantern in your tent and as a flashlight in the dark. Get Black Friday Sale: Now $19.99 + Free Shipoping for GGoldHorse 2-in-1 Wireless Bluetooth 3.0 Hands-free Speaker with LED Lantern Flashlight for iPhone 6S / 6S Plus / 6 Plus / 6 / iPad Pro Samsung S6 Edge S6 HTC ONE M9 HUAWEI P8 etc. Elephone Phones Carnival: $149.99 for Elephone P8000, $124.99 for Elephone P6000 PRO , $169.99 for Elephone M2 and $239.99 for Elephone Vowney Lite + Free Shipping. (Ends: Nov.4, 2015). Shop Now. 9.7 inch Onda V989 Air Android 4.4 Tablet PC QXGA IPS Screen A83T Octa Core 2.0GHz 2GB RAM 16GB ROM WiFi Bluetooth - Gold. Gravity Sensing System/WiFi/Bluetooth Supported. Delicate design, portable and comfortable to touch. So buy this Tablet and Save 34% OFF For 9.7 inch Onda V989 Air Android 4.4 Tablet PC. Leagoo Alfa 5 5.0 inch Android 5.1 3G Smartphone SC7731 Quad Core 1.3GHz 1GB RAM 8GB ROM Dual Cameras Bluetooth GPS OTG - Black. So buy this 5.0 inch LEAGOO Alfa 5 Android 5.1 3G Smartphone Now $59.99 + Free Shipping. Clearance: $29.99 For Zeblaze Rover Ultrathin Bluetooth 4.0 Smart Watch. Zeblaze Rover Ultrathin Bluetooth 4.0 Smart Watch MTK2501 Toughened OGS Panel with Pedometer Sleep Monitoring Function - Black. Not only with gorgeous appearance - Toughened OGS panel, 8.8mm ultrathin case and premium leather band, but also built-in high precision clip - MTK2501 (108MHz) which is able to compatible with both Android and iOS system, let you experience powerful functions. Your private management experts, help you monitor the daily movement, always check the movement distance, speed and the number of steps, energy consumption etc.. Enjoy unfettered movement while helping you achieve your health goals. To monitor the quality of your sleep, give you accurate reminding. Timely rest, avoid fatigue. Seventy percent of sub-health, sedentariness is a major factor. Sitting still for 40 minutes is sedentariness, sedentariness is unhealthy, we should change the unhealthy way of living, the smart watch could remind you to rest. Can control your smart phone to take photos and you can enjoy the pleasure of taking photos on your wrist. (Only Android phones can do) You also can listen music without taking out of your smartphones because of the smart watch can control your phone to play music. Unique proximity sensor system, when the distance between cell phone and smart watch exceeds a certain distance, the smart watch will sent alarm. No need to worry about your phone will be lost. When the function is turned on, your smart watch will ring or vibrate when the distance between smart watch and phone is a certain distance. (needs to install the Smartwatch.apk application in mobile phone terminal) When a call or message is coming, you can check it without taking out of your mobile phone. Support Twitter, G-mail, WhatsApp push message, you can easily communicate with your friends or family. When the watch is connected with the mobile phone, it will display mobile phone contacts in the machine (can display 1000). Can display the current atmospheric pressure and the current temperature. Calculate the relative height after a certain distance. Get this Clearance: $29.99 + Free Shiping for Zeblaze Rover Ultrathin Bluetooth 4.0 Smart Watch. The first time you wear uWear, you will not want to take uWear off! Because uWear has fluoroelastomer sport strap as same as iWatch; 1.44 inch 2.5D arc touch screen gives you the wide viewing angle; 316L stainless steel case, it is thin, smooth and hard. Every detail is specially designed for you; Every process is strictly controlled and tested to insure quality. You deserve to have uWear. Pedometer / Sleep monitoring / Sedentary reminder: Your private management expert, monitor the daily movement, the quality of your sleep and remind you to have a rest. Enjoy unfettered moment while helping you achieve your health goals. Remote camera / music: Can control your smart phone to take photos and play music, and you can enjoy the pleasure on your wrist. Anti lost / Find phone: Unique proximity sensor system, two-way anti lost, take good care of your smart watch and phone. Dialer / Message: When a call or message is coming, you can check it without taking out of your mobile phone. So buy this Watch and Get 54% OFF + Free Shipping for Ulefone uWear Bluetooth 4.0 Smart Watch. DOOGEE X5 Android 5.1 3G Smartphone 5.0 inch IPS Screen MTK6580 Quad Core 1GB RAM 8GB ROM - Black. Camera: Back camera 5.0MP + front camera 2.0MP. Bluetooth: 4.0. GPS: GPS/AGPS. Get Special Offer: Save 35% OFF + Free Shipping for DOOGEE X5 5.0 Inch Android 5.1 3G Smartphone. Take 21% OFF For Smartisan U1 Hammer Nut 5.5 Inch Android 4.4 4G Phablet. Smartisan U1 Hammer Nut 5.5 inch 32GB 4G Phablet Android 4.4 Snapdragon 615 64bit Octa Core 5.0MP +13.0MP Camera 2GB + 32GB - Yellow. Bluetooth: 4.0. SIM Card: Dual SIM dual standby, Dual Micro SIM. So buy this Cellphone and Save 21% OFF For Smartisan U1 Hammer Nut 5.5 Inch Android 4.4 4G Phablet. 5.0 inch TCL 3S M3G Android 5.0 4G LTE Smartphone Qualcomm Snapdragon 615 64bit Octa Core 1.5GHz Eyeprint Identification 2GB RAM 16GB ROM GPS FHD Screen 8.0MP + 13.0MP Cameras - Black. So buy this Smartphone and Save 50% OFF + Free Shipping For TCL 3S M3G Android 5.0 4G LTE Smartphone 16GB ROM. Now $109.99 For 5.0 inch iNew U5 4G Smartphone. 5.0 inch iNew U5 4G Smartphone Android 5.1 MTK6735 64bit Quad Core 1.0GHz 1GB RAM 16GB ROM 8.0MP Main Camera GPS. Sensor: Gravity sensor, Proximity sensor, Light sensor. Features: GPS, OTG. So buy this 5.0 inch iNew U5 4G Smartphone Android 5.1 MTK6735 16GB ROM Now $109.99. Take 12% OFF Z07-5S Mobile Phone Monopod Selfie Stick. Z07-5S Mobile Phone Monopod Selfie Stick. Are you feeling trouble for selfie? With it, everything is not a problem. Now buy it! Take 12% OFF Z07-5S Mobile Phone Monopod Selfie Stick. Get 60% OFF For Beelink X2 Smart TV Box. Beelink X2 Smart TV Box Android 4.4 XBMC WiFi H3 Quad-Core 1GB RAM 8GB ROM H.265 Google Player Support 4K x 2K - The World's Most Affordable 4K TV Box. Looking for more than just a simple streaming box? The Beelink X2 Android 4.4 TV Box does it all. Running the full Android 4.4 OS gives you the ability to run virtually any Android APP on your TV. The powerful H3 quad core processor with the Mali400MP2 graphics engine provides stellar performance for high definition video playback. XBMC runs smoothly with 4K x 2K hardware decoding from local media and your favorite XBMC streaming add-ons. Enjoy high performance HD streaming from the internet and local media to your TV from now on! Buy this TV Box and Get 60% OFF For Beelink X2 Smart TV Box. Extra 8% OFF + Up to 58% OFF For Speakers & Microphones. Up to 58% OFF for Speakers & Microphones. Use coupon "SPEAKER" at checkout. you can enjoy extra 8% off price for these cool things. What are you waiting for? Come to buy one! Offer Ends: Oct.31, 2015. Special Offer: 11% OFF For U Watch U11 Smartwatch. U WATCH U11 Smartwatch Watch Phone with MTK2502 CPU Sleep Monitor Pedometer Bluetooth. SIM card / Bluetooth phone call(Bluetooth v4.0). You can dial or answer a phone call from your wrist watch. Effortlessly send/receive messages to have a good interaction with your friends. When installed the APK on mobile, U11 supports APP messages push which runs on phone taskbar i.e. QQ, Wechat, SMS, Missed calls, Trademanager, Weather, Notification at the first moment and never misses important information. Sync and play the phone music by Bluetooth connection with mobile, fantastic music, enjoy your heart. The best suitable screen size with high definition picture displaying gives you great experience. 1.59 inch TFT touch screen. So buy this Watch and Get 11% OFF For U Watch U11 Smartwatch. Get Extra 8% OFF + Up to 69% OFF For Mobile Power Bank. Up to 69% OFF For Mobile Power Bank. Here are various mobile power bank to choose. Come to pick one up and buy it. With coupon "powerbank9", you can enjoy extra 8% off price. Charge your devices, and charge your life! Offer Ends: Oct.31, 2015. Shop Now. 34% OFF For 8 Inch Colorfly G808 Android 4.4 3G Phablet. 8 inch Colorfly G808 Android 4.4 3G Phablet MTK6592 Octa Core 1.3GHz WXGA Screen 1GB RAM 16GB ROM Cameras WiFi GPS -White. Gravity Sensing System/Light Sensing System/Proximity Sensing System/Cameras/WiFi/Bluetooth/GPS Function Supported. Gravity sensing system: Can fluently and sensitively run various applications. GPS function: Free you from getting lost in street and the world is your oyster with the locating system. Bluetooth 4.0: Supports fast transmission of data, pictures and files, and more faster than Bluetooth 3.0. Screen: 8 inch capacitive 5-point touch panel 1280x800(WXGA). 4000mAh battery: Can multimanage the current, power and the temperature and increase the performance dynamically. Buy this Tablet and Save 34% OFF For 8 Inch Colorfly G808 Android 4.4 3G Phablet. Get Extra 8% OFF + Up to 56% OFF For Projectors!! Up to 56% OFF For Projectors. Use coupon "project09" you can enjoy extra 8% off price to get one of these projectors. What are you waiting for? It provides a variety of useful feature and service to facilitate you work and leisure activities. Now buy it! Offer Ends: Oct.31, 2015. Take 51% OFF For USB Power Adapter for iPhone. 8 Pin Stripe Design Woven Texture Flat Cable and US Standard Power Adapter for iPhone 5 5S 5C iPad Air - Blue. So buy this and Take 51% OFF For USB Power Adapter for iPhone. Plus Get Free Shipping. Take 60% OFF For Chiptrip MXV S805 Mini PC Multimedia TV Box. Chiptrip MXV S805 smart TV box, which not only can read flash drive, external HDD, TF card, but also can support all HD movies, including 3D moves. Besides, it is also an online streaming player and game player. Through wired networking or WiFi, you can connect your local network and internet, download many free android APK from Google android market, and watch online videos such as NETFLIX, XBMC, YOUTUBE, NETFLIX, QQ, SKYPE, GAMES, etc. With this TV box, you can greatly enjoy the movies, videos, and games, etc. NEVER MISS IT! Buy this and Take 60% OFF For Chiptrip MXV S805 Mini PC Multimedia TV Box. Special Offer: Extra $35 OFF For MEIZU M2 5.0 Inch Android 5.1 4G Smartphone. 5.0 inch MEIZU M2 Android 5.1 4G Smartphone MTK6735 64bit Quad Core 1.3GHz 2GB RAM 16GB ROM 5MP + 13MP Cameras - White. Rear camera: 13 megapixel camera, CorningGorilla Glass 3 protective lens glass, f/2.2 aperture, 5-element lens, Burst mode, Panoramic lens, Single flash. Front camera: 5 megapixel, 4-element lens, f/2.0 aperture FotoNation 2.0 smart selfie enhancement, Face AE face light boost. Sensors: Hall Effect sensor, Gravity sensor, IR proximity sensor, Ambient light sensor, Touch sensor, Digital compass. Get Special Offer: Extra $35 OFF For MEIZU M2 5.0 Inch Android 5.1 4G Smartphone. Use coupon code: MEIZUM210 at checkout. Low to $17.49 For 100+ Kinds of Car DVR. Special Offer: Only $72.99 For CSA91 TV Box. CSA91 TV Box 4K x 2K RK3368 Octa-core Android 5.1 H.265 WiFi 2.4G HDMI 2.0 Bluetooth 4.0 with Clock Display TF Card HDMI USB OTG Slot - Black. CSA91 TV Box brings high performance HD streaming from the internet and local media to your TV. No more paying a monthly bill or subscription for shows and content that you don't watch! Add-ons for KODI are pre-installed to stream content from TV shows, to movies, to live sports all for free! Get this Special Offer: Only $72.99 for CSA91 TV Box 4K x 2K Octa-core Android 5.1 Bluetooth 4.0. Quadcopters Sale - Save up to 53% OFF!! Quadcopters Sale - Save up to 53% OFF!! Want to buy a quadcopter or quadcopter accessories? Enjoy 8% OFF with coupon "RCQUADCO" at dealsmachine.com! Offer Ends: Oct.15, 2015. Only $129.99 For Ulefone Paris 5.0 inch Android 5.1 4G Smartphone. Ulefone Paris Android 5.1 5.0 inch 4G Phablet HD IPS OGS Screen MTK6753 64bit Octa Core 1.3GHz 2GB RAM 16GB ROM 5.0MP + 13.0MP Cameras. So buy this Ulefone Paris Android 5.1 4G Smartphone 5.0 inch Now Only $129.99 + Get Free Shipping. DOOGEE F3 Pro Android 5.1 4G Smartphone 5.0 inch 2.5D Corning Gorilla Glass Screen MTK6753 64bit 1.5GHz Octa Core 3GB RAM 16GB ROM 13.0MP Camera GPS - Black. Buy this Doogee F3 Pro Octa Core 3GB RAM Smartphone Now $159.99 + Free Shipping. Take 10% OFF For Huawei MediaPad 8 Inch Android 5.1 4G Phablet. 8 inch HUAWEI MediaPad M2 - 801L Android 5.1 4G Phablet Hisillicon Kirin 930 Octa Core 2.0GHz WUXGA IPS Screen 3GB RAM 32GB ROM WiFi GPS Bluetooth Functions - Gold. Main Features: Core: Octa Core 2.0GHz. RAM + ROM: 3GB + 32GB offers ultrafast surfing online, video playing and 3d gaming experience enhanced with DDR3 memory which makes all applications faster. Whether it is needed for work, study or play this phablet will suit your needs and 32GB internal memory slot for all your apps and media. TF card: Up to 128GB (not included). Gravity sensing system: Can fluently and sensitively run various applications. GPS function: Free you from getting lost in street and the world is your oyster with the locating system. OTG function: Can connect with keyboard, mouse, projector and so on. Bluetooth 4.0: Supports fast transmission of data, pictures and files, and more faster than Bluetooth 3.0. Dual cameras: 8.0MP back camera with auto focus makes HD video recording and video calls more clearly and vividly. And you will be surprised at 2.0MP front camera for selfie. 8 inch screen: 1920 x 1200 IPS screen with full viewing angle delivers ultimate detail and lifelike color for a crystal-clear picture. Android 5.1 + Emotion UI 3.1: Latest Android system with high performance and interface brings a new future for tablet. 2G + 3G + 4G networks: Supports 2G + 3G + 4G high speed internet access, and the ultra outstanding downlink speed of GSM + WCDMA + FDD-LTE makes your web pages load faster and never stuttered. 4800mAh battery: Can multimanage the current, power and the temperature and increase the performance dynamically. Buy this and Take 10% OFF For Huawei MediaPad 8 Inch Android 5.1 4G Phablet. Extra 8% OFF + Up to 53% OFF for USB Flash Drives!! With coupon code "USB", you can enjoy extra 8% off for these different style USB flash drives. Little body with huge capacity memory. You deserve to have one! Plus Save Up to 53% OFF!! Offer Ends: Oct. 20, 2015. Save Up to 71% OFF + Extra 8% OFF For Headphones. Save Up to 71% OFF + Extra 8% OFF For Headphones. Use coupon code: headph09 for various headphones. Pick one up and wear it to enjoy the wonder of sounds! Shop Now. Offer Ends: Oct.25, 2015. OPPO Mirror 5s Android 5.1 4G LTE Smartphone 5.0 inch HD IPS Screen MSM8916 64bit Quad Core 1.2GHz 2GB RAM 16GB ROM Camera: 5MP + 8MP - Silver. It provides a variety of useful feature and service to facilitate your work and leisure activities. Now buy it! Save 49% OFF For OPPO Mirror 5S 5.0 Inch Android 5.1 4G Smartphone. Enjoy extra 8% off price with coupon "quadcore" for all kinds of mobiles phone and tablets, which are here waiting for you to be added to your shopping cart. let them make your life make a difference. Opportunity knocks but once, so we must make the most of it. Shop today! Offer Ends: Oct,25. 2015. 20000mAh Portable Power Bank Li- polymer Battery 3-in-1 USB Cable with LED Battery Capacity Indicator for iPhone 6 / 6 Plus Samsung S6 HTC etc. Do you still feel bothering when your phone is out of power at critical moment? Please do not worry any more, and this power bank is really what you need to solve the out-of-power problem. It looks simply and fashionable. It's easy to carry, what's more, it has huge capacity to guarantee your phone's power using. Now buy it. Take 2.50$ OFF for 20000mAh Portable Power Bank. P13 Wireless Bluetooth Stereo Headphone Headset Earphone Foldable / Stretchable Support TF Card / FM Function for Smartphones. This headphone support TF card and FM function for smartphones. Put this headphone on and enjoy you music world. Buy this and Get 1.67$ OFF For P13 Wireless Bluetooth Stereo Headphone. Special Offer: Save 11$ OFF Cube T8 8 Inch Android 5.1 4G Phablet. 8 inch Cube T8 Android 5.1 4G Phablet MTK8735 Quad Core 1.3GHz WXGA IPS Screen 1GB RAM 16GB ROM WiFi GPS HDMI Functions - White. It offers ultrafast surfing online, video playing and 3d gaming experience enhanced with DDR3 memory which makes all applications faster. Whether it is needed for work, study or play this tablet will suit your needs and 32GB internal memory slot for all your apps and media. Get Special Offer: Save 11$ OFF Cube T8 8 Inch Android 5.1 4G Phablet. Smart Watches: Extra 8% OFF!! With coupon "Smartwatch09", you can enjoy extra 8% off for these smart watches. All of them provides useful feature and service to facilitate your daily life. Now put it into you chart. Shop Now. Offer Ends: Oct.10, 2015. Extra 24$ Off For Mlais M7 5.5 Inch Android 5.1 4G Phablet. Mlais M7 Plus Android 5.1 4G Phablet 5.5 inch IPS HD Screen MTK6753 64bit 1.5GHz Octa Core 3GB RAM 16GB ROM 5MP + 13MP IMX214 Camera Fingerprint - Black. Buy this Smartphone and you can Get Extra $24 Off For Mlais M7 5.5 Inch Android 5.1 4G Phablet. With coupon code: DWA3B at checkout. Extra 8% OFF For Car Charging! With coupon "carcharge", you can enjoy extra 8% off for these car charging. Come to choose one! Let your life be full of energy! Offer Ends: Oct.10, 2015. Shop Now. Special Offer: Take 6$ OFF for Q7 TV Box Android 4.4. Q7 TV Box Android 4.4 RK3188 Quad Core Mini PC WiFi Bluetooth HDMI Connectivity with AV Input. Q7 is a revolutionary smart media hub based on a quad core ARM cortex-A9 processor with quad core Mali-400MP4 GPU and the latest Android OS. sign into Google Play store to download the favorite applications and install them directly into Q7. Q7 comes with Ethernet, Bluetooth and WiFi connection, you could connect to many of your devices within the same network and share the contents amongst them, such as videos, music and photos. Get Special Offer: Take $6 OFF for Q7 TV Box Android 4.4. With coupon "2000mAh", you can enjoy extra 8% off price for these mobile power banks. Pick one up and get you device full of power! Save Up to 52% OFF!! Enjoy your vigorous life! Offer Ends: Oct.10, 2015. Handy Adjustable Car Air Vent Clip Mount for iPhone 6 / 6 Plus Samsung Galaxy S6. Practical mobile phone clip holder on car air vents; 360 rotatable cradle, easy to adjust your viewing angle; Compatible with iPhone 6 / 6 Plus / 5 / 5S / Samsung / HTC etc; Compact size, convenient to carry; Clip stand width: 5.2 - 8.3 cm. Buy this and Take 20% OFF for Handy Adjustable Car Air Vent Clip Mount for Phone. 5.2 inch innos D6000 Android 5.0 6000mAh Large Capacity Battery 4G Smartphone with MSM8939 Octa Core 64bit Gorilla Glass Screen 16MP Rear Camera 5MP Front Camera 3GB RAM 32GB ROM. Get Labor Day Offer - Save $77 OFF For 5.2 inch innos D6000 Android 5.0 Smartphone. Plus Get Free Shipping. Only $119.99 For Ubro M1 Android 5.0 Smartphone 2GB RAM + 16GB ROM. Ubro M1 Android 5.0 4G Smartphone 5.0 inch IPS Screen MTK6735 64bit Quad Core 1.3GHz 2GB RAM 16GB ROM NFC OTG GPS Bluetooth 4.0 5MP + 13MP Cameras - Black. Buy this Smartphone and Get Free Shipping, Now Only $119.99 for Ubro M1 Android 5.0 Smartphone 2GB RAM + 16GB ROM. ASUS ZenFone 2 (ZE551ML) 2GB RAM 16GB ROM Android 5.0 4G 5.5 inch Phablet FHD Screen Intel 64bit Z3560 Quad Core 1.8 GHz 13MP + 5MP Dual Cameras - Gray. Buy this Cellphone and you can Save 51% OFF For 5.5" ASUS ZenFone 2 2GB RAM 16GB ROM Android 5.0 Quad Core. 5.0 inch Huawei P8 Lite Android 5.0 4G LTE Smartphone Kirin 620 1.2GHz Octa Core 2GB RAM 16GB ROM HD Screen 13.0MP Camera Bluetooth 4.0 - Black. So buy this Cellphone and Get 18% OFF For 5.0" Huawei P8 Lite Android 5.0 Octa Core. 5.5 inch ONEPLUS TWO FHD Screen Corning III Gorilla Glass Android 5.1 Lollipop 4G Phablet with Qualcomm Snapdragon 810 64bit Octa Core 3GB RAM 16GB ROM 5MP +13MP Cameras - Black. So buy this Smartphone and Save 35% OFF For 5.5" ONEPLUS TWO Android 5.0 Lollipop 4G Phablet with Octa Core 3GB RAM 16GB ROM. 10.1 inch Venstar 8050 Android 4.4 Tablet PC WSVGA Screen A83T Octa Core 1.3GHz 1GB RAM 16GB ROM WiFi Bluetooth - Black. Get this Tablet and Save 32% OFF For 10.1" Venstar 8050 Android 4.4 Tablet PC. 9.7 inch AMPE Android 4.2 3G Phone Tablet PC MTK8382 Quad Core 1.3GHz XGA Screen 8GB ROM GPS FM - White. Get this Tablet and Save 30% OFF for 9.7" AMPE Android 4.2 Tablet PC. 5.5 inch VKWORLD VK700 Android 4.4 3G Smartphone MTK6582 Quad Core 1.3GHz 1GB RAM 8GB ROM HD IPS Screen 13.0MP Camera - White. So buy this 5.5" VKWORLD VK700 Android 4.4 Smartphone Quad Core Now $78.99. 5.5 inch Mstar M1 Pro Android 5.0 4G Phablet with MTK6752 64bit 1.7GHz Octa Core 2GB RAM 16GB ROM - Black. SIM card: Dual SIM card dual standby, Micro sim and Standard sim. Camera: 8.0MP front camera , 13.0MP with flash light back camera. Bluetooth: Yes. GPS: Yes. So buy this Cellphone and Save 26% OFF for 5.5" Mstar M1 Pro Android 5.0 4G Phablet. Quad Core Phones Sale: Up to 54% OFF and Low to $53.99!! Quad Core Phones Sale: Up to 54% OFF and Low to $53.99!! Cube I6, AMPE tablet, Lenovo and HUAWEI phones are waiting for you! Sale Ends: Oct.25, 2015. So Shop Now. Use coupon code: quadcore at checkout. 5.5 inch ONEPLUS TWO FHD Screen Corning III Gorilla Glass Android 5.1 Lollipop 4G Phablet with Qualcomm Snapdragon 810 64bit Octa Core 4GB RAM 64GB ROM 5MP +13MP Cameras. Display: Corning III Gorilla Glass, 5.5inch, 1920 x 1080 Pixel FHD screen. CPU: Qualcomm Snapdragon 810 processor (MSM8994). System: Oxygen OS based on Android 5.1. Camera: 5.0MP front camera + 13.0M Pixels high definition back camera with flashlight and auto focus. Bluetooth: 4.1. Buy this Cellphone and Save an Extra 128$ OFF For ONEPLUS 2 Android 5.1 Octa Core 4GB RAM 64GB ROM. 50% OFF For MXIII-G TV Box 1000M Ethernet Android 5.1 Quad Core. MXIII - G TV Box 1000M Ethernet Android 5.1 Quad Core Amlogic S812 2GB 8GB 4K x 2K H.265 Google TV Player 2.4G 5G WiFi Bluetooth HDMI with AV TF Card Input - Black. Looking for more than just a simple streaming box? The MXIII-G Android 5.1 TV Box does it all. Running the full Android 5.1 OS gives you the ability to run virtually any Android APP on your TV. The powerful Amlogic S812 Quad Core processor with the Octa Core ARM Mali-450 graphics engine provides stellar performance for high definition video playback. XBMC runs smoothly with 4K x 2K hardware decoding from local media and your favorite XBMC streaming add-ons. Enjoy high performance HD streaming from the internet and local media to your TV from now on! Buy this TV Box and Get 50% OFF For MXIII-G TV Box 1000M Ethernet Android 5.1 Quad Core. Get 18% OFF For 10.1" PIPO W3f Android 4.4 + Windows 8 Tablet. 10.1 inch PIPO W3f Android 4.4 + Windows 8 Tablet PC WUXGA IPS Screen Intel Z3735F Quad Core 1.83GHz 2GB RAM 32GB ROM WiFi Bluetooth. Delicate design, portable and comfortable to touch. Buy this Tablet and Get 18% OFF For 10.1" PIPO W3f Android 4.4 + Windows 8 Tablet. Only $20.99 For Mould King Super Mini 2.4G 4CH RC Quadcopter. Mould King 33033 Super Mini 2.4G 4 Channel 6 - axis RC Quadcopter 360 Degree Flip / Rotation Fly - Red. 6 - axis gyro quad - rotor aircraft flight, strong stability, easily implement various flight movements, stronger wind resistance, easier to control. 2.4G technology adopted for anti-interference, more copters fly at the same time can not interfere with each other. Super mini size, the smallest volume and the lightest weight, beyond imagination stability and operability. With LED lights, possible for night fly. Charging time: About 20mins. Flying time: 10mins. Control distance: 30-50m. So buy this Mould King Super Mini 2.4G 4CH RC Quadcopter Now $20.99 and Get Free Shipping. Transformers Accompany You to Adventure the Uncharted World. Are you a crazy Transformers Optimus Prime enthusiast? RC Fengyuan Optimus Prime Truck Toy is just here waiting for you to challenge the future and adventure world. Let's join in the Transformers team together with beloved Fengyuan, excellent experience is ready for you to witness! Buy this Toy and Save 55% OFF For Fengyuan Radio Control Robot Transformers Optimus Prime Truck RC Toy. Use coupon code: ADY9 at checkout. Happy back to school! Enjoy 8% Off and Get Free Shipping. With coupon code: BTSDM at dealsmachine.com. Special offer for cell phones, watches, tablet PCs and accessories! Offer Ends: Sep.9, 2015. So Shop Now. OUKITEL U8 Universe Tap Android 5.1 Smartphone 4G LTE Phablet 5.5 inch HD Screen MTK6735 64bit Quad Core 2GB RAM 16GB ROM Press Fingerprint - White. SIM Card: Dual SIM dual standby, one Standard SIM,one Micro SIM Card. Camera : Front camera 5.0MP Back camera 13.0MP AF with flash light. Fingerprint Press Sensor. Support Gravity/Light/Proximity Sensing System. Buy this Cellphone and Save 38% OFF For 5.5" OUKITEL U8 Universe Tap Android 5.1 Smartphone. Plus Get Free Shipping. Syllable G08S Professional Wireless Bluetooth V4.0 Noise Cancellation High-definition Stereo Headphone/Headset for iPhone/iPod/HTC/Samsung/Blackberry/etc - Black. Feature: Soft PE foam ear cushion; Great voice insulation; Built-in CSR bluetooth chip; Double noise reducing technology with five layers noise reducing structure; Super bass; Support MP3 format; Intelligent music and phone shift function; Anti-deformation and scratches resistant; With iOS, Android IC touch panel. So buy this Headphone and Save 45% OFF for Syllable G08S Bluetooth V4.0 Stereo Headphone. V5 Multifunctional 21000mAh Emergency Car Jump Starter High Capacity Power Bank with Dual USB Outputs for Auto iPhone 6 / 6 Plus iPad Samsung S6 Tablet etc. Features: High capacity battery of 21000mAh is adopted for fast charging. Support auto 12V emergency jump start and entirely replace the included battery for a car startup. It also supports general mobile phone / laptops charging and completely can be used as mobile power bank. With dual USB outputs, you can charge two devices simultaneously. High luminance and multi-modes LED light ( Normal / flashing / SOS signal). It is the ideal choice for night shift workers, overtime workers and many others. LCD digital screen indicate battery status, real-time recharging reminders, automatic shutdown under no-load condition. Over-current protects the device from overload, making it more convenient, safer and more energy-efficient. Satre current: 400A. Peak current: 750A. So buy this product and Get 17% OFF for V5 21000mAh Hi-Capacity Power Bank + Car Jump Starter. 6572 3G Android 4.2 3G Phablet MTK6572 Dual Core 1.0GHz with 10.1 inch WSVGA Screen Bluetooth GPS Cameras - White. Highlight: RAM: 1GB (972.70MB available). ROM: 8GB (1008.29MB+5.00GB available). Gravity Sensing System WiFi/GPS/Bluetooth Function. Support Video Calls Online. Buy this Tablet and Save 52% OFF For Android 4.2 Phablet MTK6572 with 10.1 Inch WSVGA Screen. H901 Android 4.4 9 inch WVGA IPS Screen Tablet PC Quad Core RK3126 1.2GHz 512MB RAM 8GB ROM WiFi Dual Cameras Function - White. Highlight: Android 4.4 9.0 inch A33 tablet PC with WVGA IPS screen. Support external TF card up to 32GB (not included). RAM: 512MB. ROM: 8GB (987.96MB+5.28GB available). Gravity Sensing System/Dual Cameras/WiFi functions supported. Support video calls online. So buy this Tablet and Save 48% OFF for Android 4.4 9 Inch A33 Tablet PC. 6572 3G Android 4.2 3G Phablet MTK6572 Dual Core 1.0GHz with 10.1 inch WSVGA Screen Bluetooth GPS Cameras - White. RAM: 1GB (972.70MB available). ROM: 8GB (1008.29MB + 5.00GB available). Gravity Sensing System WiFi/GPS/Bluetooth Function. Support Video Calls Online. Buy this and Save 52% Off for Android 4.2 Phablet MTK6572 with 10.1 Inch WSVGA Screen. Huawei Smartphone. Good news and good choice for you! 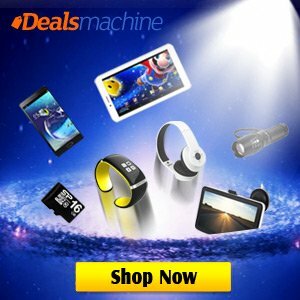 At dealsmachine.com with coupon "huawei" you could get up to 30% Off and $10 OFF $100+, $15 OFF $150+, $20 OFF $200+. Come and try it now! Special Offer: Enjoy 8% OFF for Best Headphone Deals!! Special Offer for Best Headphone Deals. You like music? Good news for you! At dealsmachine.com with coupon "headphones" you could Enjoy Extra 8% Off and the best ever music experience! MEIZU M2 Note Android 5.0 Lollipop 4G LTE Phablet 5.5 inch FHD IPS Screen MTK6753 64bit Octa Core 1.3GHz 2GB RAM 16GB ROM 13.0MP Rear Camera - Blue. Features: Display: 5.5 inch FHD Screen. CPU: MTK6753 64bit Octa Core 1.3GHz. System: Android 5.0. RAM + ROM: 2GB RAM + 16GB ROM. Camera: 5.0MP front camera + 13.0MP back camera. Bluetooth: 4.0. GPS: GPS, A-GPS, GLONASS. Sensors: Hall Effect sensor, Gravity sensor, IR proximity sensor, Gyroscope, Ambient light sensor, Touch sensor, Digital compass. SIM Card: Dual SIM dual standby, dual Nano SIM. Buy this Cellphone and Get Extra $50 OFF for Meizu M2 Note Smartphone. With coupon code: MEIZUM2 at checkout. Special Offer: Extra 15$ OFF for Chuwi Vi8 Tablet PC. 8 inch Chuwi Vi8 Android 4.4 + Windows8.1 Tablet PC WXGA IPS Screen Intel Z3735F Quad Core 1.8GHz 2GB RAM 32GB ROM WiFi OTG Bluetooth - Black. Get Special Offer: Save an Extra $15 OFF for Chuwi Vi8 Tablet PC. With coupon code: ChuwiVi8 at checkout. Lenovo K3 Note (k50-t5) Android 5.0 Smartphone 4G LTE Phablet 5.5 inch FHD Screen MTK6752 64bit 1.7GHz Octa Core 16GB ROM 13.0MP Camera - Yellow. Features: CPU: MediaTek MT6752 64bit 1.7GHz octa-core high-speed processing platform. GPU: ARM MALI-T760. OS: Android 5.0. RAM + ROM: 2GB + 16GB. Camera: Dual cameras back - 13MP, front - 5.0MP. Screen: 5.5 inch IPS capacitive screen, FHD 1920 x 1080 pixels. SIM Card: Dual SIM card dual standby, dual Micro SIM. Bluetooth?4.0. Support Wifi/3G/4G/GPS/Gravity/Gesture /FM/MP3/MP4. Buy this Smartphone and Save 52% OFF for Lenovo K3 Note Android 5.0 Smartphone. 10.1 inch 1088 Android 4.2 Netbook WM8880 Dual Core 1.5GHz WSVGA Screen 4GB ROM WIFI Camera - Black. Highlights: CPU: WM8880 Cortex-A9 Dual Core 1.5GHz. GPU: Mali-400MP. OS: Google Android 4.2. RAM: 512MB DDR3 (411.07MB available). ROM: 4GB (2.62GB available). Front Camera: 0.3MP. External Storage: Micro SD Card (up to 32GB) - not included. Screen: 10.1 inch WSVGA Screen 1024 x 600. WIFI Function Supported. Get Back to School Sale: Save 48% OFF + Free Shipping for 10.1 Inch Android 4.2 Netbook. Cube I10 Tablet PC with Android 4.4 + Windows 8.1 10.6 inch 1366 X 768 IPS Screen Intel Z3735 Quad Core 1.8GHz 32GB ROM HDMI Bluetooth. Features: GPU: HD Graphics Gen7. RAM + ROM: 2GB + 32GB offers ultrafast surfing online, video playing and 3d gaming experience enhanced with DDR3 memory which makes all applications faster. Whether it is needed for work, study or play this tablet will suit your needs and 32GB internal memory slot for all your apps and media. CPU: Intel Z3735 64-bit 1.8GHz quad core processor has a better performance, 60% power consumption reduction and almost half package areas than the 32-bit processor, delivering plenty of power for multitasking and fueling casual games and movies. Gravity sensing system: Can fluently and sensitively run various applications. Bluetooth 4.0: Supports fast transmission of data, pictures and files. 10.6 inch screen: 1366 x 768 full-view IPS screen offers good experiences for watching videos and browsing the Web. Android 4.4 + Windows 8.1 system: Dual operating system with more excellent interface, compatibility and running effect. HDMI output: You could use a HDMI cable to connect your tablet to output the tablet display onto TV screens, monitors or projectors, creating your personal home theater. 6600mAh battery: Relying on Intel OS power manage system, Cube i7 remix can multimanage the current, power and the temperature and increase the performance dynamically. Get this Special Offer: Save 28% OFF for Cube I10 Tablet PC. Discovery Adventures DC200 SHD 1296P 2.7 Inch Car DVR Ambarella A7 Accident Camera Video Recorder Driving Camcorder 170 Degree Angle Support G-Sensor - Black. Want to record your life while driving? Discovery Adventures DC200 2.7 inch screen night vision SHD 1296P car camcorder at dealsmachine.com. Compact and intelligent design with 170 degree wide viewing angle! Support motion detection, night vision, loop recording and G-sensor. So buy this Discovery Adventures DC200 Night Vision Car DVR Camcorder with 170 Degree Wide Angle Support G-Sensor for Just $84.99. 5.0 inch Elephone P6000 Pro 3GB Android 5.1 4G Smartphone with 64bit MTK6753 1.5GHz Octa Core 16GB ROM 13.0MP Rear Camera - Black. Highlight: Screen: 5.0 inch IPS Capacitive screen, 1280x720 HD Screen resolution. SIM Card: Dual SIM card dual standby, dual Micro SIM Card. CPU: MTK6753 64bit, Octa Core, 1.5GHz. OS: Android 5.1. RAM + ROM: 3GB + 16GB. Camera: Rear camera 13.0MP, front camera 2.0MP. Bluetooth: 4.0. GPS: GPS, A-GPS. And buy this Elephone P6000 Pro Android 5.1 Smartphone Now Only $139.99. 5.0 inch Elephone P6000 Pro Android 5.1 4G Smartphone with 64bit MTK6753 1.5GHz Octa Core 2GB RAM 16GB ROM 13.0MP Rear Camera - White. Screen: 5.0 inch IPS Capacitive screen, 1280x720 HD Screen resolution. SIM Card: Dual SIM card dual standby, dual Micro SIM Card. CPU: MTK6753 64bit, Octa Core, 1.5GHz. GPU: MALI T720. OS: Android 5.1. RAM + ROM: 2GB+16GB. Camera: Rear camera 13.0MP, front camera 2.0MP. Bluetooth: 4.0. GPS: GPS, A-GPS. Dual WiFi: Support connections on both 2.4GHz (802.11b/g/n) and 5GHz (802.11a) links. Get this Back to School Sale: Low to $119.99 for Elephone P6000 Pro Android 5.1 Smartphone. Elephone P8000 Android 5.1 4G LTE Phablet 5.5 inch FHD Screen MTK6753 64bit Octa Core 3GB RAM 16GB ROM Fingerprint ID 13.0MP Camera GPS 4165mAh Battery. So buy this Cellphone and Save 30% OFF for Elephone P8000 Android 5.1 Phablet 5.5 inch FHD Screen. 5.0 inch DOOGEE DG310 Android 4.4 3G Phablet with MTK6582 1.3GHz Quad Core 1GB RAM 8GB ROM WiFi GPS OTG WVGA IPS Screen. Get this Special Offer: Save 51% OFF + Ship in 24hrs for 5.0 inch DOOGEE DG310 Android 4.4 3G Phablet. Get 6% OFF For Android 4.4 Tablet PC!! 10.1 inch IPPO Y3 Android 4.4 Tablet PC with qHD A33 Quad Core 1.3GHz 1GB RAM 8GB ROM OTG Dual Cameras. Buy this Tablet and Get 6% OFF + Extra 8% OFF For Android 4.4 Tablet PC. With coupon code: Tablet11 at checkout. 5.0 inch KingSing S2 MTK6582 Quad Core Android 4.4 3G Phablet 1.3GHz QHD Screen 1Gb RAM 8GB ROM Dual Camera. So buy this Cellphone and you can Get 50% OFF for Android 4.4 3G Phablet. Save Up to 36% OFF For Android 4.4 Smart Watch Phone! ZGPAX S8 3G Android 4.4 Smart Watch Phone MTK6572 Dual Core 1.0GHz with 1.54 inch Touch Screen Single SIM Bluetooth Camera MP3 MP4. Buy Special Offer: Save Up to 36% OFF For Android 4.4 Smart Watch Phone. Special Offer: Take 35% OFF For 5.5" DOOGEE DG580 Android 4.4 3G Phablet. 5.5 inch DOOGEE DG580 Android 4.4 3G Phablet with MTK6582 1.3GHz Quad Core 1GB RAM 8GB ROM WiFi GPS QHD Screen. Doogee DG580 5.5 inch Quad Core 3G Phablet represents the next step in Android evolution. It brings affordable power, combining cutting edge hardware with enhanced functionality, the DG580 is as powerful as it's stunning. With a stunning superslim profile measuring a mere 6.5mm and weighing only 120g, enjoy stand-out design and stylish aesthetics. Showing off its credentials, the Doogee DG580 offers a truly mesmerizing 5.5 inch HD display for razor sharp visuals, bright colors and unparalleled clarity. Perfect for visually demanding HD movies, high resolution photographs and the latest 3D games, the capacitive screen offers an incredible immersive experience. It is all about enabling you to enjoy entertainment, news and social networking effortlessly. Buy this Special Offer: Take 35% OFF + Ship in 24hrs for 5.5 inch DOOGEE DG580 Android 4.4 3G Phablet. New Arrival: Get 50% OFF for Android 4.2 Mini TV Box! Q7 RK3188 Quad Core Android 4.2 Wi-Fi 2GB RAM 8GB ROM TV Box Mini PC Built-in Bluetooth HDMI AV. Q7 is a revolutionary smart media hub based on a quad core ARM cortex-A9 processor with quad core Mali-400MP4 GPU and the latest Android OS. sign into Google Play store to download the favorite applications and install them directly into Q7. Q7 comes with Ethernet, Bluetooth and WiFi connection, you could connect to many of your devices within the same network and share the contents amongst them, such as videos, music and photos. Get this New Arrival & Save 50% OFF for Android 4.2 Mini TV Box. Cyber Monday Sale: Up to 70% OFF!! Cyber Monday Sale: Enjoy Up to 70% OFF + Extra 8% OFF with coupon code: MP3Play17 for numerous MP3 players at Dealsmachine. Shop Now. Cyber Monday: Take 52% OFF For Elephone G4 Android 4.4 3G Smartphone! 5.0 inch Elephone G4 Android 4.4 3G Smartphone with MTK6582 1.3GHz Quad Core 1GB RAM 4GB ROM WiFi GPS HD IPS Screen. Get this Cyber Monday Deal: Save 52% OFF for Elephone G4 Android 4.4 3G Smartphone. Take 52% OFF For 5.0" GT-I9600 Android 4.4 3G Phablet. 5.0 inch GT-I9600 Android 4.4 3G Phablet with MTK6572 1.3GHz Dual Core 4GB ROM WiFi WVGA Screen. Support Gravity/Proximity Sensing System. FM/MP3/MP4/Bluetooth/GPS Function Supported. Buy this Cellphone you can Take 52% OFF + Ship in 24hrs For 5.0 inch GT-I9600 Android 4.4 3G Phablet. 25% OFF For Android 4.2 3G Phablet with 5.2 Inch! Kingelon G9000 Android 4.2 3G Phablet with 5.2 inch FHD Screen MTK6592 Octa Core 1.7GHz 1GB RAM 16GB ROM GPS WiFi Gesture Sensing. Kingelon G9000 Android 4.2 3G Phablet, which is very popular nowadays because of its advanced technology, elegant appearance and various of funny applications. You must be attracted by its delicate design and powerful functions. Kingelon G9000 adopts 5.2 inch display screen together with 1920 x 1080 resolutions bring you a relatively broad visual field to enjoy high definition and high-fidelity pictures and movies. Kingelon G9000 3G Smartphone equipped MTK6592 Octa Core 1.7GHz CPU ensures stable performance in playing games / browsing webs / watching online movies and any other fields you expect. 13.0MP rear camera provides the convenience of capturing every colourful scenery moment during your life. 1GB RAM and 16GB ROM make it convenient to store some necessary applications what you prefer. Gesture Sensing feature enables you to flip the screen whatever you wanna just swing your hands. Immodestly say that Kingelon G9000 3G Phablet is the symbol of noble identity and graceful status. It is also a landmark creative intelligent digital devices with reasonable affordable price! Buy this Cellphone and Save Up to 25% OFF for the Android 4.2 3G Phablet with 5.2 Inch FHD Screen! Mpie 809T Android 4.2 3G Smartphone with 5.0 inch HD OGS Screen MTK6592 Octa Core 1.7GHz 2GB RAM 16GB ROM Gesture Sensing OTG GPS 13.0MP Camera. Buy this Smartphone and Get Special Offer: Save 50% OFF For Mpie 809T Android 4.2 3G Smartphone. Ships in 24 hrs. Kingelon N8000 Android 4.2 3G Unlocked Phone with 5.5 inch QHD Screen MTK6582 Quad Core 1.3GHz 1GB RAM 4GB ROM GPS Gesture Sensing 13.0MP Camera. 5.5 inch QHD Capacitive (5-point) Multitouch Screen. Dual SIM, Dual Standby. Dual cameras Front 5.0 MP Back 13.0 MP (the back one with flash light and auto focus). Wireless Internet. So buy this Smartphone and Save 50% OFF For the Kingelon N8000 Android 4.2 3G Unlocked Phone with 5.5 inch QHD Screen. Plus Get Free Shipping! Ships in 24 hrs! 4.3 inch iMAN I3 Android 4.2 3G Smartphone with MTK6589T 1.5GHz Quad Core 1GB RAM 16GB ROM WiFi GPS Waterproof Dustproof Shockproof QHD IPS Screen. Support Gravity Sensing System. FM / MP3 / MP4 / Bluetooth Function Supported. So buy this Cellphone and you can Save 8% OFF for iMAN I3 Android 4.2 3G Smartphone with Waterproof, Dustproof, Shockproof and 4.3 inch QHD IPS Screen. U Watch U8 Smartwatch Bluetooth Watch Passometer Touch Screen Answer and Dial the Phone. This is a new Bluetooth Smart U Watch U8 which is compatible with all Bluetooth V2.0 or above enabled smartphones, tablets and PCs (support Android 2.3 or above), such as iPhone 4, 4S, 5, 5S, Sumsung S3, S4, Note 2, Note 3, Note 4 etc. Get this Special Offer: Save Up to 25% OFF, Now Only $37.99 for the U8 Smartwatch Bluetooth Watch! 7 inch Lenovo S5000 Android 4.2 3G Phone Tablet PC MTK8389 Quad Core 1.2GHz WXGA IPS Screen Dual Cameras WiFi GPS Bluetooth 16GB ROM 1GB RAM. Support Video Calls Online. Buy this Tablet and you can Get 8% OFF For the Lenovo S5000 Android 4.2 3G Phone Tablet PC. DOOGEE DG150 Android 4.2 3G Unlocked Phone with 3.5 inch IPS Screen MTK6572 Dual Core 1.0GHz 4GB ROM Waterproof Dustproof GPS Dual Camera. Buy this and you can Get 50% OFF For DOOGEE DG150 Android 4.2 3G Unlocked Phone. 5.0 inch DOOGEE DG310 Android 4.4 3G Phablet with MTK6582 1.3GHz Quad Core 1GB RAM 8GB ROM WiFi GPS OTG WVGA IPS Screen. The DOOGEE DG310 5.0" Quad Core 3G Phablet represents the next step in Android evolution. DOOGEE's new flagship brings affordable power, combining cutting edge hardware with enhanced functionality, the DG310 is as powerful as it’s stunning. With a stunning superslim profile measuring a mere 7.9mm, enjoy stand-out design and stylish aesthetics. Showing off its credentials, the DOOGEE DG310 offers a truly mesmerizing 5.0 inch display for razor sharp visuals, bright colors and unparalleled clarity. Perfect for visually demanding HD movies, high resolution photographs and the latest 3D games, the capacitive screen offers an incredible immersive experience. It is all about enabling you to enjoy entertainment, news and social networking effortlessly. And buy this Smartphone you can Get 50% OFF for DOOGEE DG310 Android 4.4 3G Phablet with Quad Core, 1GB RAM, 8GB ROM and 5.0 inch WVGA IPS Screen. Ships in 24 hrs. 7 inch Onda V702 Android 4.4 Tablet PC A33 Quad Core 1.3GHz WSVGA Screen Camera WiFi 512MB RAM 8GB ROM. Gravity Sensing System/WiFi Function Supported. Screen: 960 x 540 (QHD) Capacitive (5-Point). Support Video Calls Online. So buy this and you can Save 49% OFF for Onda V702 Android 4.4 Tablet PC with Quad Core, 7 inch WSVGA Screen and 8GB ROM. 5.0 inch KingSing S2 MTK6582 Quad Core Android 4.4 3G Phablet 1.3GHz QHD Screen 8GB ROM Dual Camera. Support Gravity/Light/Proximity Sensing System. FM/MP3/MP4/Bluetooth/GPS Function Supported. Buy this Cellphone and Get 12% OFF for the KingSing S2 MTK6582 Android 4.4 3G Phablet with 5.0 inch QHD Screen, 8GB ROM, Dual Camera and Quad Core. Up to 50% OFF For Android 4.4 4G Phablet!! 5.0 inch MPIE G7 Android 4.4 4G Phablet with MTK6582 1.3GHz Quad Core 2GB RAM 8GB ROM WiFi GPS OTG WiFi Display Screen Off Screen Gestures Fingerprint Unlock HD Screen. The Mpie G7 5.0” HD Quad Core 4G Phablet represents the next step in Android evolution. Mpie's new flagship brings affordable power, combining cutting edge hardware with enhanced functionality, the G7 is as powerful as it’s stunning. With a stunning superslim profile measuring a mere 8mm and weighing only 120g, enjoy stand-out design and stylish aesthetics. Showing off its credentials, the Mpie G7 offers a truly mesmerizing 5.0” HD display for razor sharp visuals, bright colors and unparalleled clarity. Perfect for visually demanding HD movies, high resolution photographs and the latest 3D games, the capacitive screen offers an incredible immersive experience. The G7 is all about enabling you to enjoy entertainment, news and social networking effortlessly. Buy this Cellphone and Save Up to 50% OFF for the Android 4.4 4G Phablet with 5.0 Inch HD Screen, MTK6582 1.3 Ghz, Quad Core, 8GB ROM and Dual Standby! 5.5 inch Uhappy UP550 Android 4.4 3G Phablet with MTK6582 1.3GHz Quad Core 1GB RAM 16GB ROM WiFi GPS OTG HD Screen. Support Gravity/Light/Proximity Sensing System. FM/MP3/MP4/Bluetooth/GPS/OTG Function Supported. Buy this Cellphone and Get 8% OFF for the Uhappy UP550 Android 4.4 3G Phablet with Quad Core, 16GB ROM and 5.5 inch HD Screen. Bluedio F3 Touch Control Bluetooth Handsfree Earphone Stereo Bluetooth V4.1 In-Ear Headphone with Mic for Tablet PC Smartphones. Smart-phone apps are becoming the north star for millions of people who use them to navigate through life - shopping, playing, reading, dating, learning, and more with their fingertips. Now, the Bluedio F3 APP comes around! You can control pairing, adjust EQ via this F3 APP and do more by simple touch and click. Buy this product and Get Free Shipping + Save 26% OFF for the Bluedio F3 Touch Control Stereo Bluetooth In-Ear Headphone with Mic Support Tablet PC and Smartphones. Fashion Bluetooth Watch LED Light Display with Dial / Call Answer / SMS Reminding / Music Player / Anti-lost / Passometer / Thermometer for Samsung / HTC + More - R-Watch M26. Sync music. Sync phone clock to watch. Sync 1000 phonebook, 200 call log, 10 SMS. Sync message. With pushing message, such as MMS, QQ, Wechat, news title, calendar events, etc. Sync such as LINE, Instagram Facebook (message), Gmail, CNN App, ZAKE, etc. Remote android phone camera operation. Can connect to all BT phone and tablet. Android smart watch installed APP can support information push. Buy this product and Get 16% OFF for the R-Watch M26 Fashion LED Light Display Bluetooth Watch with Music Player, Anti-lost and Passometer. BT801 Personalized Bluetooth V3.0 Remote Control Self Timer Camera Shutter with Lanyard for iOS / Android Phone. As we all known, iPhone series as well as mainstream smartphones boast for their high resolution and excellent pixel. Since then, selfie has become more and more popular in recent years. If you are one of the selfie enthusiasts, you may be interested in BT801 Personalized Bluetooth V3.0 Remote Control Self Timer. Made of superior plastic material with highly advanced technology, this self-timer supports both IOS 5.0 and Android 4.2.2 systems, which makes it suitable for almost all types of cellphones. What is more, with Bluetooth feature, it can easily search device available within certain meters so that you can quickly link your cellphone with this self-timer. Just slightly press the button, you will get as legible photos as possible. What a wonderful gadget! You should not lose the opportunity to capture and record every unforgettable details without the help from anyone else! Buy this and Get Free Shipping + 9% OFF for the BT801 Personalized Bluetooth V3.0 Remote Control Self Timer Camera Shutter with Lanyard Support iPhone and Android Phone. 7 inch 721S Android 4.4 Tablet PC A23 Dual Core 1.54GHz WVGA Screen 4GB ROM Dual Camera. Gravity Sensing System/Cameras/WiFi Function Supported. Support Video Calls Online. So buy this 721S Android 4.4 Tablet PC Now Only $52.99. Ulefone N9002 Android 4.2 3G Unlocked Phone with 5.7 inch HD720 Screen MTK6582 Quad Core 1.3GHz 1GB RAM 8GB ROM GPS Gesture Sensing Smart Screen. Buy this Cellphone and Get 46% OFF & Now Only $156.99 on Ulefone N9002 Android 4.2 3G Smartphone. Guophone I9500L Android 4.2 3G Phablet with 5 inch WVGA IPS Screen MTK6582 Quad Core 1.3GHz 1GB RAM 4GB ROM. Buy this Cellphone and Get 68% OFF, Now Only $102.99 for Guophone I9500L Android 4.2 3G Phablet. Ship in 24 hrs! Many people have their phones in their hand bags and don't feel the vibration or even hear their ring tone in busy areas. With this awesome bracelet you can have a wearable fashion accessory and never miss a call again. Caller ID and LED Time Display This beautiful bracelet also displays the caller ID, so you can see the phone number of the person calling, instead of having to struggle opening your bag in a busy area, you can instantly tell if the call is important or not. Another great feature of this bracelet is that it features a time display. It is also the best gift for your family and friends. Buy this Watch Now Only $27.99 For Newest L12S OLED Sports Watch with Pedometer Bluetooth Bracelet, Call ID Display / Answer / Dial / SMS Sync / Music Player / Anti-lost for iPhone / Samsung / HTC + More. HighLights: Stunning premium quality quad core phablet. Powerhouse: Quad Core Cortex A7 1.3GHz CPU. Razor Sharp: 9.7” XGA (1024 x 768) IPS Capacitive Screen. Connected: 3G, Bluetooth, b/g/n WiFi, GPS and GSM+WCDMA (fully unlocked for worldwide use). Practical: Massive 32GB ROM storage for all your multimedia needs. Stay in Charge: Massive 6,000mAh battery. And Get this Special Offer! Now Only $161.99 for 9.7 inch VOYO X1 Android 4.2 3G Phablet MTK8382 Quad Core 1.3GHz XGA IPS Screen Dual Cameras WiFi GPS Bluetooth Sleep 32GB ROM. Many people have their phones in their hand bags and don't feel the vibration or even hear their ring tone in busy areas. With this awesome bracelet you can have a wearable fashion accessory and never miss a call again. Caller ID and LED Time Display This beautiful bracelet also displays the caller ID, so you can see the phone number of the person calling, instead of having to struggle opening your bag in a busy area, you can instantly tell if the call is important or not. Another great feature of this bracelet is that it features a time display. Unlike most wireless techniques, bluetooth uses time division duplex to arrange the transmission slots so that it can avoid collision.The top-rated 250mAh battery enables you run into the bracelet for 168 hours constantly. It is also the best gift for your family and friends. Buy this product and you can Get 52% OFF, Now Only $27.99 for Newest L12S OLED Watch and Sports Pedometer Bluetooth Bracelet with Call ID Display / Answer / Dial / SMS Sync / Music Player / Anti-lost for iPhone / Samsung / HTC + More. FM transmitter allows you to output audio from this navigator to your car stereo speakers. Built-in Hi-Fi speaker, volume adjustable. Button and touch-screen operation. Built-in radar warning system to early remind you of the radar speed measurement test. Intuitive and easy-to-use interface. The navigating software could run the Micro SD card directly. Built-in rechargeable Li-battery which can be powered by travel and car charger. Easily data transmitting, communicate with computer through USB cable. So buy this GPS and you can Save 50% OFF, Now Only $31.99 for Car GPS Navigator with W-488A 4.3 inch TFT Touch Screen, 4GB ROM, Multimedia Function, etc. MYSAGA M1 Android 4.2 3G GPS Smartphone with 4.5 Inch HD 720 Screen MT6589 Quad Core 1.2GHz 1GB RAM 4GB ROM. FM / MP3 / MP4 / Bluetooth / GPS function supported. WiFi. And buy this MYSAGA M1 Android 4.2 3G GPS Smartphone Now Only $149.99. Welcome to Dealsmachine.com, one of the leaders in global online wholesale. we provide the very best in high quality consumer electronics and other products including cheap Android phones and Android tablets, the latest accessories for mobiles and tablets, hobbies and toys, watches, outdoor and sports equipment, and household items.